Valid only on selected Tuesdays in 2017 which includes 10 January, 14 February, 14 March, 11 April, 9 May, 13 June, 11 July, 8 August, 12 September, 10 October and 14 November. Valid upon presentation of Sunway Pals membership and MyKad / Expatriate Identification Card at Sunway Lagoon ticketing counter(s). Special rate valid for adult admission ticket only. Limited to one admission ticket per member and limited to 5,000 pieces per selected Tuesdays. Children below 90cm enter the park for free. ‘Children’ denotes child aged 12 years and below. ‘Senior Citizen’ denotes age from 60 years and above will enjoy contracted Child Rate. Children must be accompanied by an adult at all times within the park. All transactions made are strictly on credit card or cash basis upon purchase. All rates quoted inclusive of 6% GST. Rates may be subjected to further taxes as and when implemented by the state government. Sunway Pals Management reserves the right to refuse, alter, amend, delete or add to the stated terms and conditions or withdraw this promotion at anytime without prior notice. General park rules of Sunway Lagoon apply. SUNWAY PALS is a loyalty program that awards its members with loyalty points for purchase of goods/service at participating merchants' outlets and Sunway Business Units. 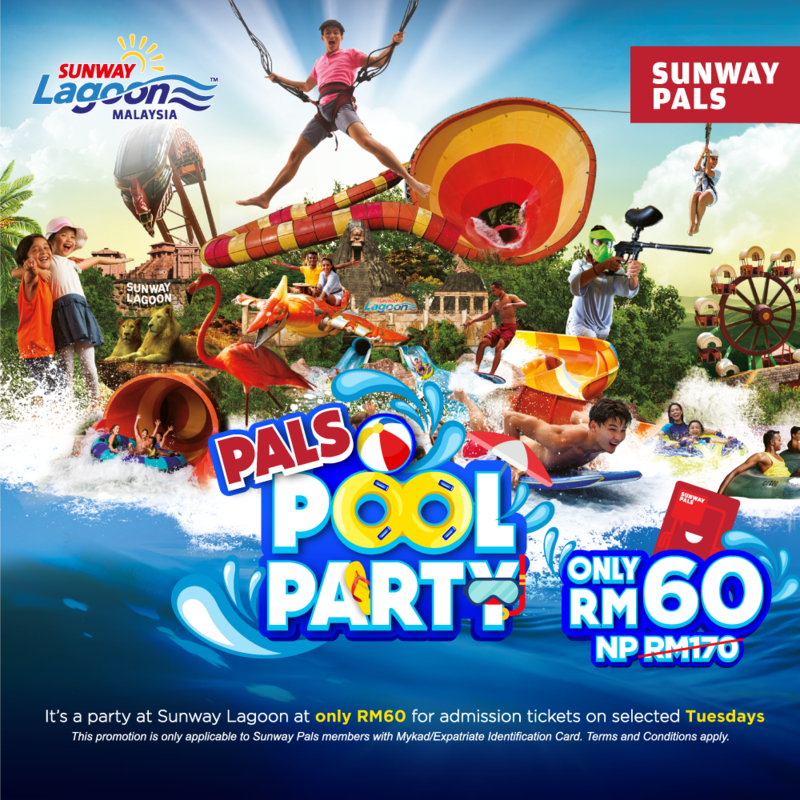 Who is eligible to register for SUNWAY PALS membership? All residents of Malaysia and foreigners, aged 18 years old and above are eligible to register. Where do I apply for the membership? No, there is no fee. Membership is FREE. What is the validity of the membership? There is no expiry to the membership. You do not need to renew your membership as the membership does not expire.